This early Edwardian property, formerly known as 'Hounslow', has a very interesting botanical, social and political history that goes back to the early days of European settlement in Auckland. The land was first settled by John Edgerley in 1843. Edgerley had been a gardener and botanist for Lieutenant Thomas McDonnell R.N. (Retired), who had been appointed an additional British Resident in New Zealand at the time. Edgerley established a nursery here until the time of his death in 1849. John Edgerley is notable for his introduction of Norfolk Island pine to New Zealand (see record NR/0734). This tree is thought to be one of the first generation dawn redwood specimens in New Zealand. The owner of the property at the time, Dr. Lindsay Robert Kidd G.P., was on the board of the Pukeiti Rhododendron Trust and many other horticultural societies . He was a friend of notable plantsmen such as Sir Russell Mathews at 'Tupare' in New Plymouth and William Douglas Cook at 'Eastwoodhill' near Gisborne. It is through this association with these individuals that it is thought that Kidd obtained this tree. W.D. Cook was known to have supplied a number of specimens to other keen horticulturists that he knew (See GR/0707 and TR/0711). 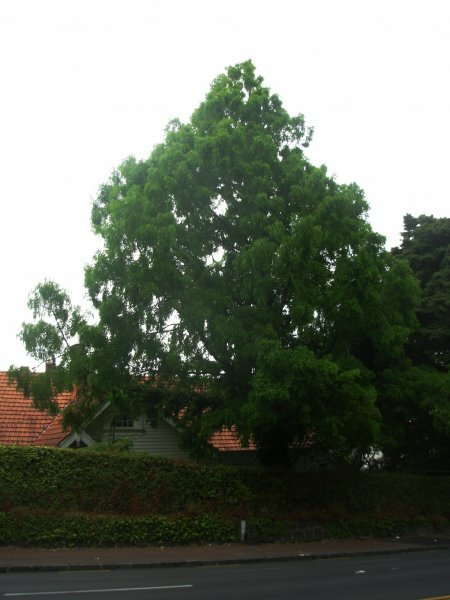 The tree was the only dawn redwood recorded in the 1971 'Historic and Notable Trees of New Zealand: Northland and Auckland' Burstall survey. The author noted the tree to be "prominently sited and the finest of this species seen in Auckland" (Cadwallader, B.G. 2012). Burstall, S.W., New Zealand Forest Service, Forest Research Institute, Mensuration Report No. 16 1971 (unpublished), page 59. The tree is in good health (2008). 30 Nov 2008 Benton, C.
Clearly visible near the front of the property.